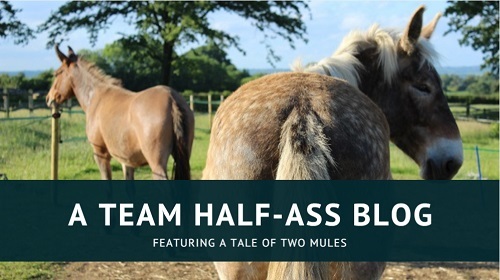 One of my favourite past-times involves combining my love of mules and history, and going in search of the role played by the humble longear in centuries gone by. For example, only today I learnt that holding your lady parts over the smoke of a burning mule hoof was considered to be a viable contraceptive in medieval Europe! We, er, weren’t very advanced compared to the rest of the world at that point in history. 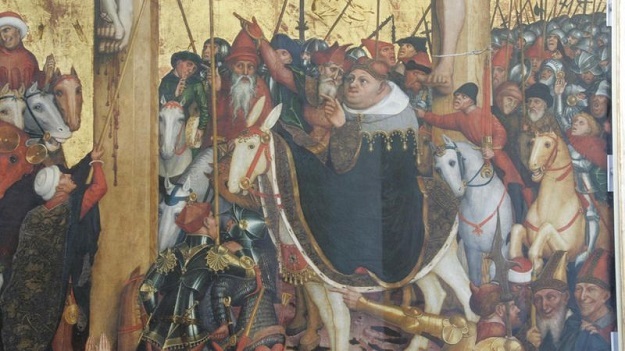 During my searches I often come across interesting depictions of mules in art – the best finds are when I’m looking for something that isn’t even mule-related, and I still find a mule (#7 on this list was one of these). I thought I would put 10 of my favourite pictures into a post for you to enjoy. Detail of a mule in Assyrian sculpture, around 7th century BC. 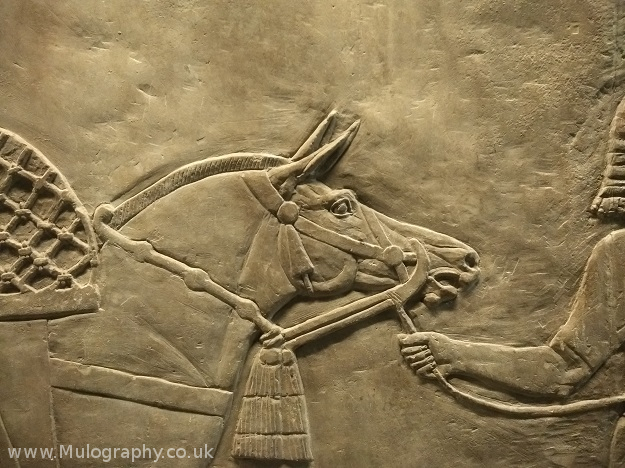 Although this particular mule is being used as a pack animal, the ancient Assyrians pioneered a communications network that saw messengers travel exclusively by muleback. A detail from a 6th century BC Caeretan hydria – a type of vase – depicting Hephaestus on a mule. One of the myths around Hephaestus involves him taking revenge against his mother, Hera, by building her a throne which she was unable to get up from once seated. Dionysus eventually went to fetch Hephaestus, got him drunk, and brought him back to Olympus on a mule. 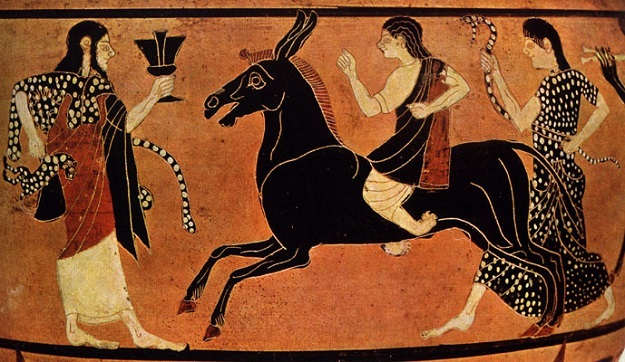 There seems to be conflicting information as to whether it was a donkey or a mule who was the sacred animal of Dionysus, but in the Hephaestus story the equine is almost always a mule. 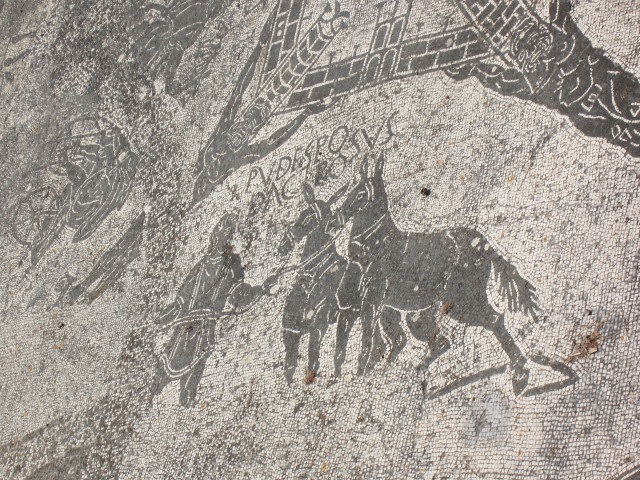 Pudes (Modest) and Podagrosus (Lame), two of the named mules depicted on a 1st century mosaic in Ostia Antica, Italy. Mules were often depicted pulling vehicles and even had their own special chariot race. 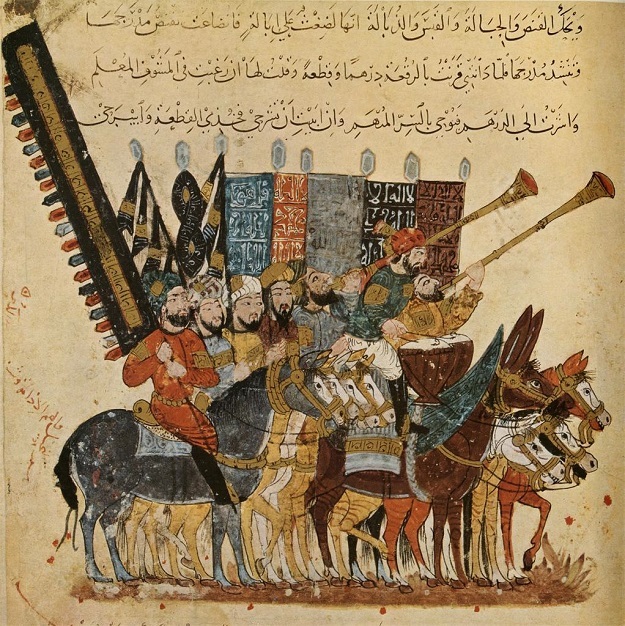 A 13th century illustration from al-Maqāmāt al-ḥarīriyah, featuring a drum mule in the centre of the line-up. Donkeys and mules had a prominent role to play in the medieval Islamic world, and there were three veterinary treatises dedicated entirely to their care. 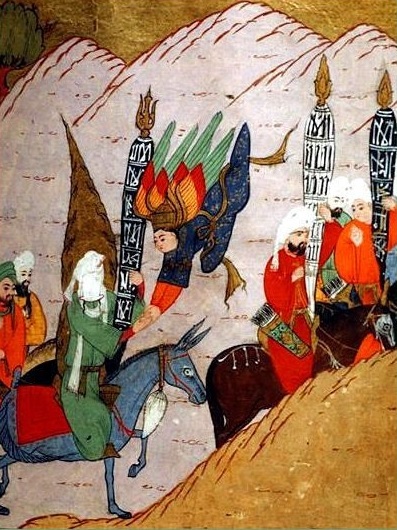 A 14th century illustration from the Siyer-i Nebi, showing the Prophet Muhammad riding his favoured mule, Duldul, and being greeted by the Archangel Gabriel. A 14th century Tibetan painting of the goddess Panden Lhamo. 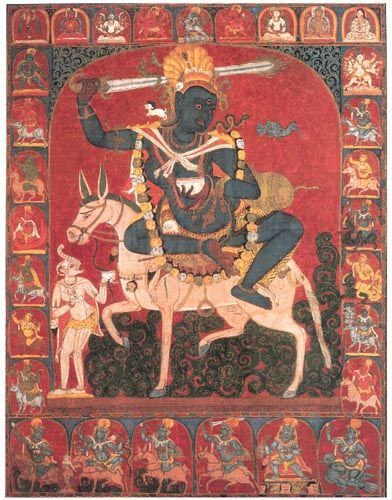 She is typically shown riding side-saddle on a white mule and crossing a sea of blood; the mule has an eye on its rump, where Panden Lhamo healed it after it was shot with an arrow by her husband (who, er, may have been a little upset that the saddle she’s riding on is made from the flayed skin of their son – there’s a lot of backstory, I encourage you to look her up). A detail from a 15th century crucifixion painting by Austrian artist, Conrad Laib. The rider is unknown but is certainly an interesting character! I thought he was a member of the clergy, but my art historian friend thinks he may have been a rich benefactor who funded the painting. Details from two 15th century paintings by Benozzo Gozzoli in the Magi Chapel, Italy. The top image is from the West Wall fresco and shows either Joseph, Patriarch of Constantinople, or Sigismund, Holy Roman Emperor. The bottom image is from the East Wall and shows Cosimo de Medici riding his brown mule – a favourite animal of his. 16th century painting of William Cecil, Lord Burghley. 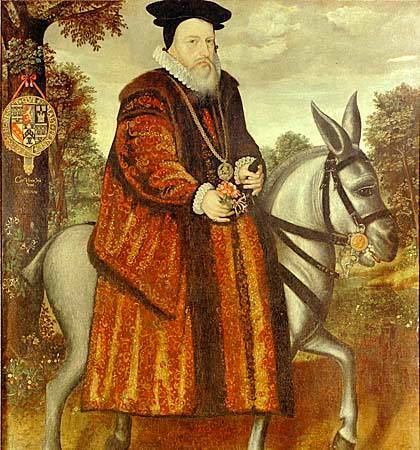 William Cecil was an adviser to Elizabeth I who attended her coronation in a carriage pulled by two white mules; mules were popular with both the aristocracy and the clergy in 16th century Europe and, as you may have gathered already from this list, the white mule in particular was an important symbol. 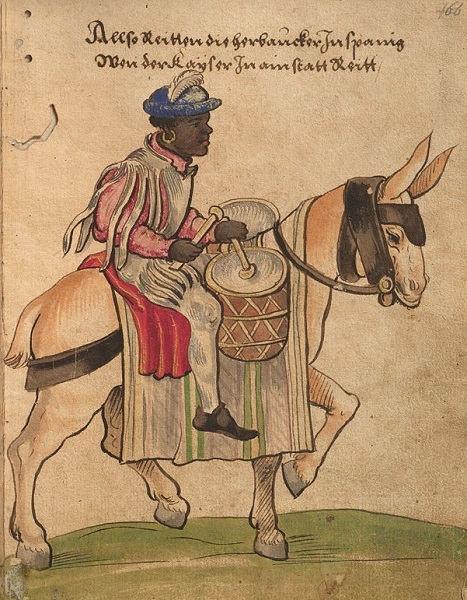 Another drum mule, this time depicted by German painter, Christoph Weiditz. This image is from a collection of drawings he made of the folk costumes worn by inhabitants of the Iberian peninsula in the early part of the 16th century. These are great! Thanks for sharing – very interesting! Thank you for your comment, I’m pleased you enjoyed it! Ah yes, I have this one! I only omitted it from this line up as I’d limited myself to 10 images. It intrigues me because the tack seems so odd – the saddle is very far back and the reins purposely fixed in position. I haven’t been able to determine whether this is artistic licence or true to life and, if the latter, what purpose it served.